Author Sondheim, Stephen, composer, lyricist. 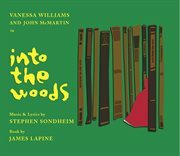 Title Into the woods [electronic resource]. Publication Info. [United States]: Nonesuch/WBR, 2002. Description 1 online resource (1 audio file (1hr., 10 min.)) : digital. Contents Act I, Prologue: Into the Woods (12:27) -- Act I: Cinderella at the Grave (1:41) -- Act I: Hello, Little Girl (3:00) -- Act I: I Guess This Is Goodbye / Maybe They're Magic (1:48) -- Act I: Our Little World (2:33) -- Act I: I Know Things Now (1:51) -- Act I: A Very Nice Prince / First Midnight / Giants in the Sky (4:24) -- Act I: Agony (2:20) -- Act I: It Takes Two (2:32) -- Act I: Stay with Me (2:28) -- Act I: On the Steps of the Palace (2:36) -- Act I: Ever After (2:26) -- Act II, Prologue: So Happy (4:01) -- Act II: Agony (reprise) (2:13) -- Act II: Lament (1:51) -- Act II: Any Moment / Moments in the Woods (4:44) -- Act II: Your Fault (1:39) -- Act II: Last Midnight (3:26) -- Act II: No More (3:53) -- Act II: No One Is Alone (3:24) -- Act II, Finale: Children Will Listen (5:08).